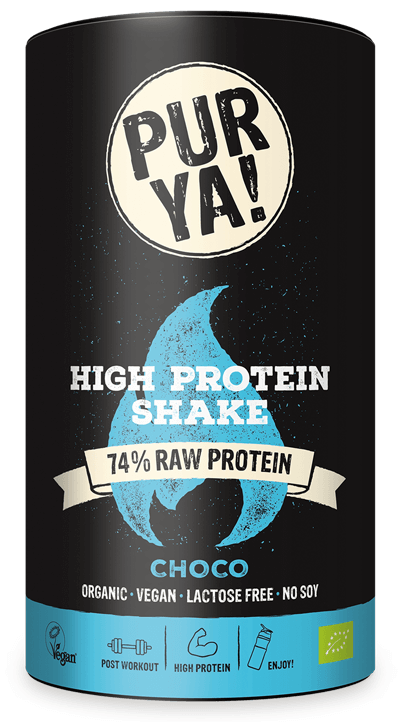 Our High Protein Shakes have a high protein content, are perfect before and after your workout, provide all essential amino acids, have high bioavailability and are perfectly suited for regeneration, muscle growth, and weight reduction. Simply mix with a plant-based beverage and enjoy. Enrich your shakes or smoothies with a delicious PURYA! High Protein Shake. We recommend using plant-based beverages, which often provide natural sweetness, e.g., rice, almond, spelt or sweet soy milk. Add two tablespoons (approximately 30g) to 300 ml and mix well – ideally in a shaker or blender. Consume the finished drink immediately, if possible. If not, chill and consume the same day. Store the container at room temperature. The PURYA! High Protein Shake is your ideal partner during sport. Rich in protein it’s the ideal drink before and after your workout. The high protein content contributes to muscle maintenance and growth. It also provides all essential amino acids and has high bioavailability. A varied and balanced diet, as well as a healthy lifestyle are important.